The city is a former centre of textile production. When this industry left the area for cheaper production centers in South-East Asia, Enschede became one of the poorest municipalities in the Netherlands. The biggest challenge of the city is to prevent higher educated (wealthy) citizens from moving to the west (Randstad). Decades of renovation work in the city center have been carried out with the goal of making Enschede more attractive to this group. Modern shopping centers and department stores that until now were only found in much larger cities have been opened. 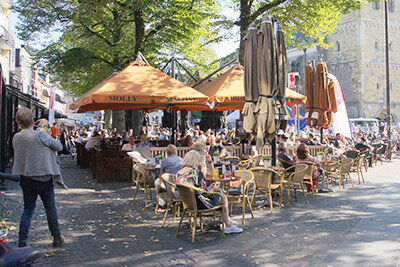 Enschede is host to many yearly festivals and the Old Market Square is often the venue for events, live music and other activities on the weekend. 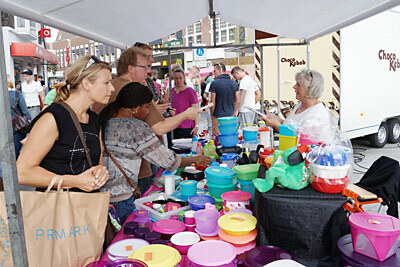 After some hesitation on the part of the city council, Enschede was able to host Roze Zaterdag in the summer of 2004 which was a huge success. This not only gave the local economy a boost, but also drew positive attention to Enschede's gay community, the largest in the east of the Netherlands. In many aspects, Enschede is admittedly trying to present itself as the Amsterdam of the east. In reality Enschede has more in common with Berlin. Like the German capital Enschede has a troubled urban economy, but is still home to a vibrant artistic scene. Also the city's laid-back attitude, by some attributed to the relatively low economic activity of its inhabitants (labour participation was about 57% in 2006) and the large numbers of students, artists and (semi-) government employees, make for a 'Berlinesque' athmosphere. The Old Market Square has the biggest terrace in the region. The proximity to Germany has, historically, been another major factor in economic activity, ranging from the smuggling of coffee and tobacco in the 19th and 20th century, to large numbers of Germans, who visit the city's shops and (especially) the weekly markets. Most natives of Enschede therefore speak German more or less fluently. The city is cooperating with the nearby municipalities of Almelo, Borne and Hengelo as Netwerkstad Twente. A governmental plan to merge with Hengelo was discarded by local opposition. The world famous Grolsch beer is brewed in Enschede. Saturdays market is popular amongst locals and German visitors.